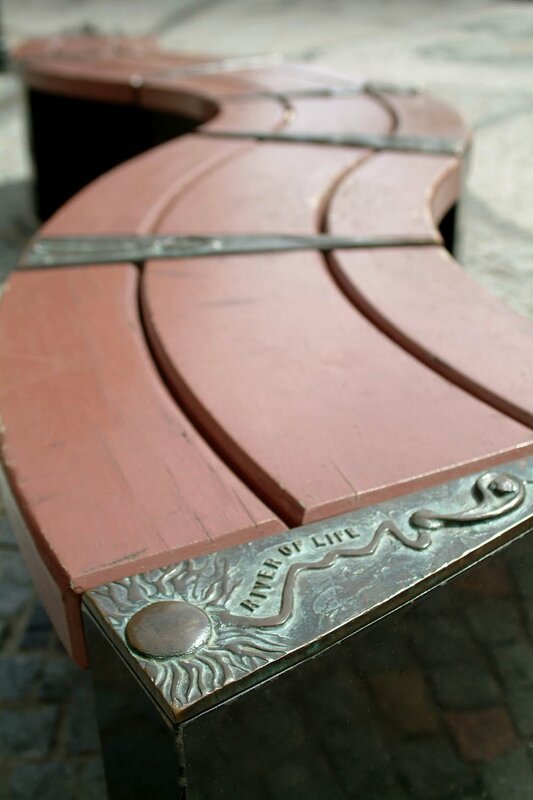 The River of Life project was developed in the aftermath of the 1993 IRA bomb in Warrington, which killed three-year-old Johnathan Ball and 12-year-old Tim Parry, and led to the death of Bronwen Vickers. It injured 54 others and affected many thousands of people. The international outrage was strongly expressed by mothers and in Dublin thousands gathered in downtown Dublin to express sorrow and revulsion over the deaths of the two children. 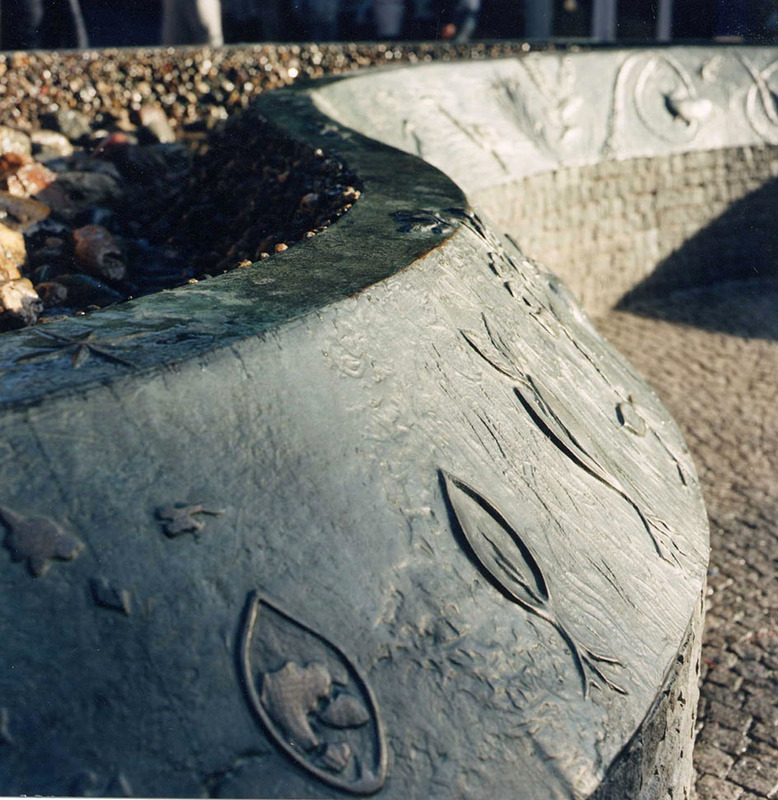 The new streetscape and integrated water feature entitled ‘The River of Life’ was officially opened on 14th November 1996 by HRH The Duchess of Kent. 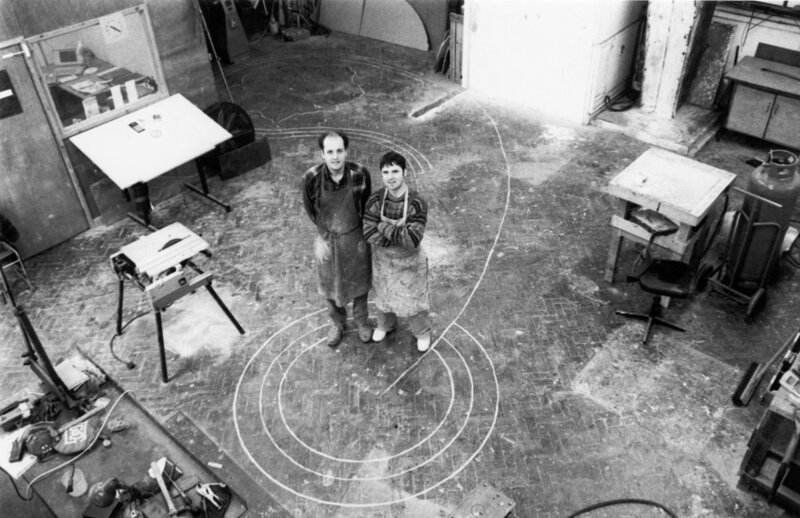 Colin and Wendy Parry were thrust into the public gaze and together with the NSPCC established a peace centre in Warrington. The Foundation for Peace and NSPCC joined forces to raise funds for the £3million Centre opened on 20th March 2000...the 7th anniversary of the IRA bomb. Two bombs exploded on Bridge Street in Warrington about 100 yards apart on 20 March at about 12:25. The blasts happened within a minute of each other with the area crowded with shoppers on the Saturday before Mothering Sunday. Witnesses spoke of shoppers fleeing from the first explosion into the path of the second. It was later found that the bombs had been placed inside cast iron bins causing large amounts of shrapnel. It was a very personal attack on the people of Warrington - and the town needed to respond to it. The City council asked to meet with me to discuss what form a memorial could take. It became clear that there were contrasting schools of thought with some looking to put it firmly in the past particularly as at the time the economic viability of the town was being threatened, and others who could imagine what I worried as being an overly personal memorial, which may not easily stand the test of time. 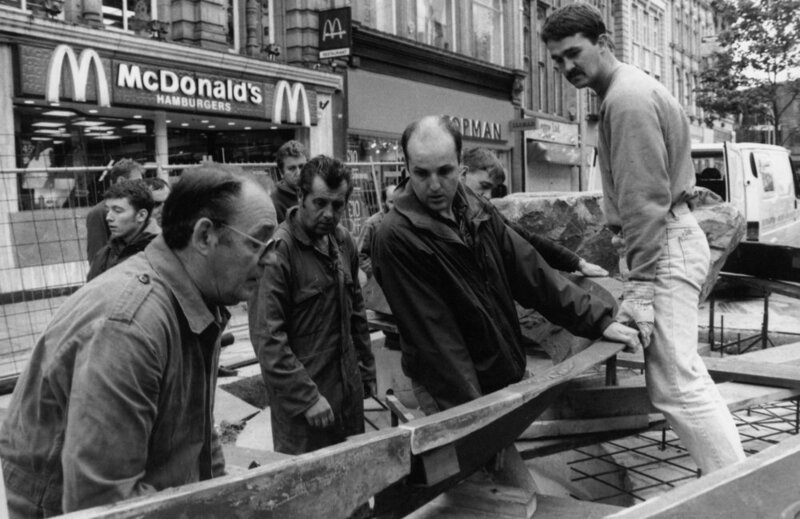 My feeling was that the street was not just physically broken but spiritually, and a response should come from a desire to bring hope, freshness and new life back to Bridge Street. Allowing the development to become, not a stark memorial in an unaltered landscape, but a symbol of renewal and faith in the power of the human spirit to triumph over adversity and to invest the future with hope. The emerging concept made a link to the river Mersey, and the thought of seeing a river running down the length of the street bringing healing and refreshment, and Inspiration was found in the dramatic imagery of the ‘river of life’ account found in the Biblical Book of Revelation, Chapter 22. 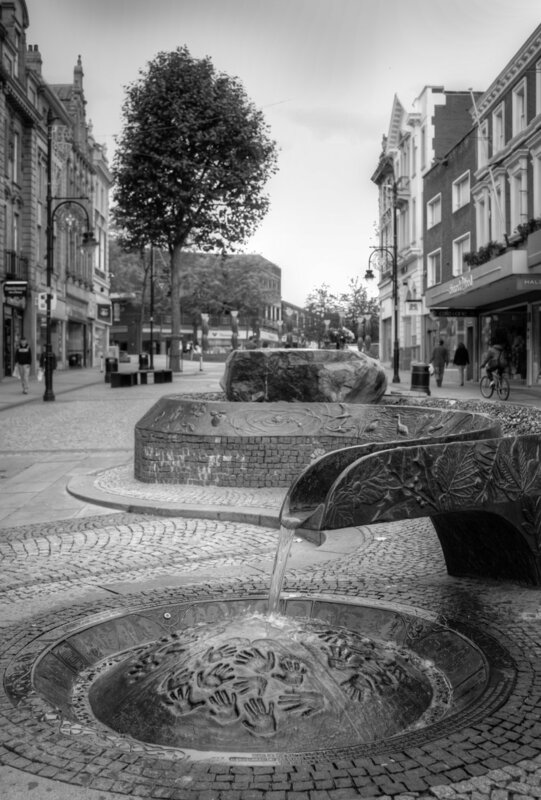 This symbolic, water source is re-created over the full length of of the pedestrianised section of Upper Bridge Street, climaxing in a raised water feature that literally springs forth from its centre. 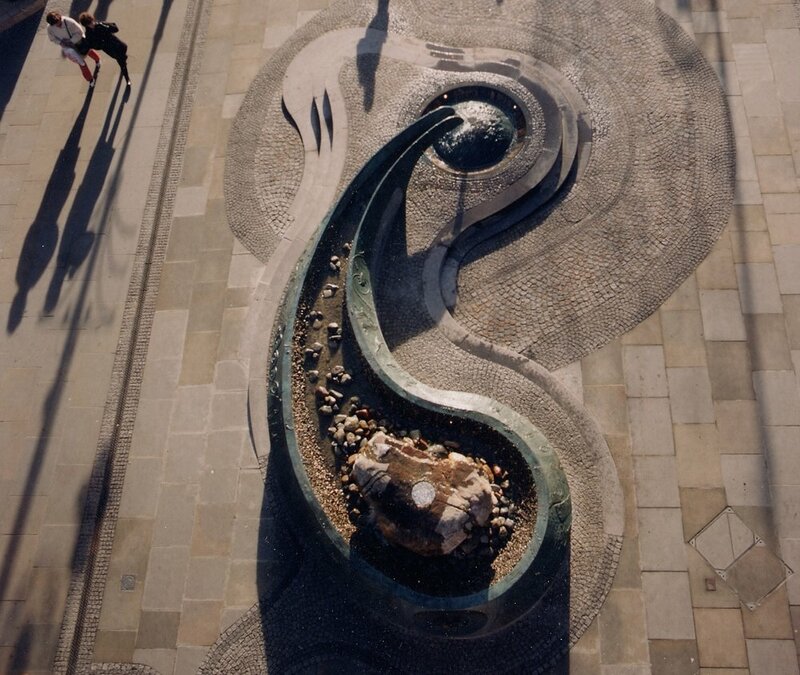 Natural stone and granite setts map out a design that accurately mirrors the meandering course of the River Mersey as it passes through the borough of Warrington. 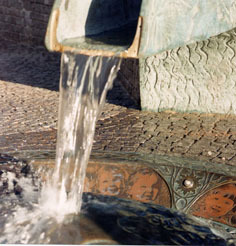 Water, both in its literal and symbolic forms, is the key to the sculpture. It is the tears shed by victims of loss, but it is also a symbol of healing, of cleansing and renewal. 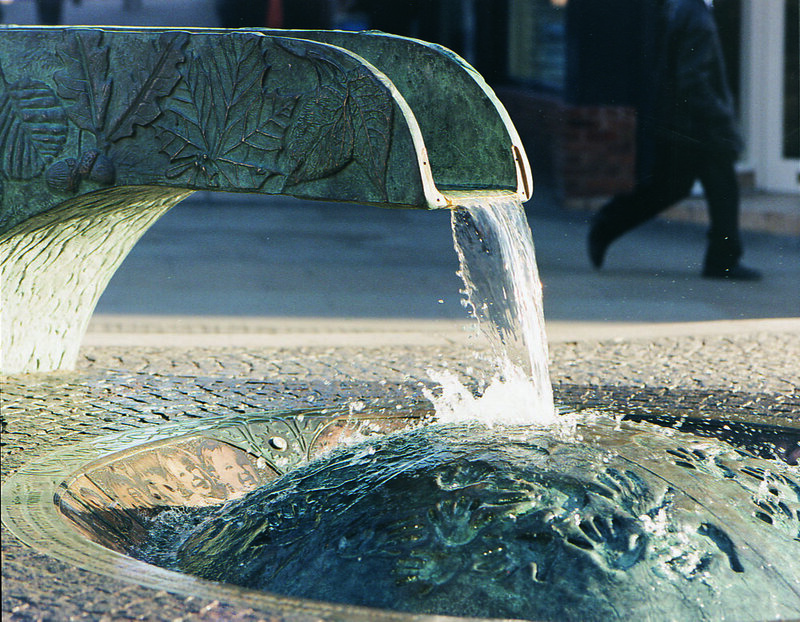 Central to the design is a tear shaped water feature where water emerges from a broken glacial boulder, flows along a bronze channel, and cascades onto a bronze dome. The dome bears the imprints of the hands of local school children. One child representing every primary school in Warrington attended a ceremony of remembrance where they pressed their hand into a soft putty dome. 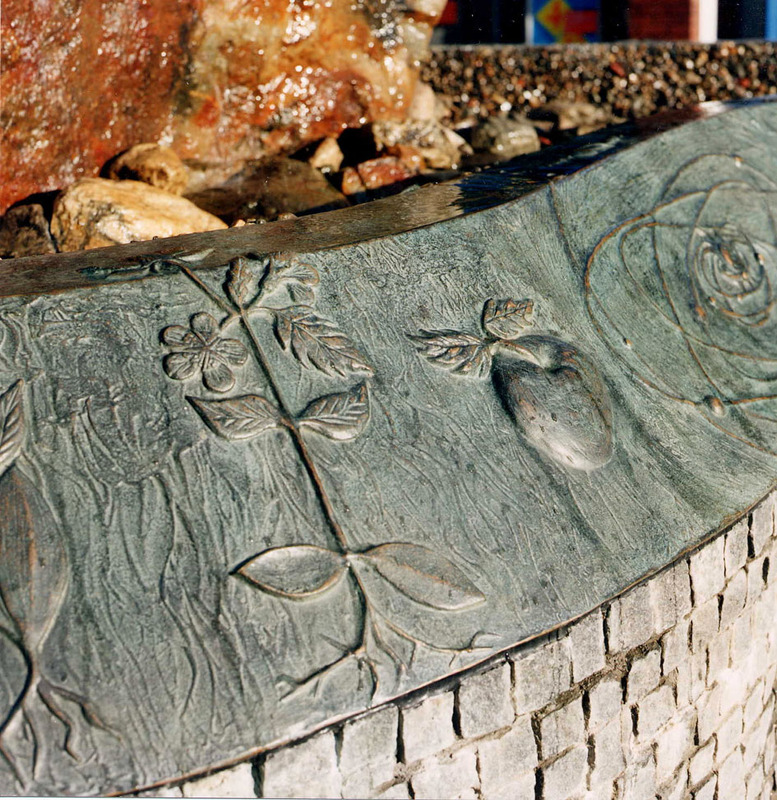 Now, the cast bronze handprints are continually washed by water flowing from the boulder - a symbolic source of healing - onto the dome and in unconscious gestures of remembrance, children spontaneously put their hands into the water to find prints that match their own. 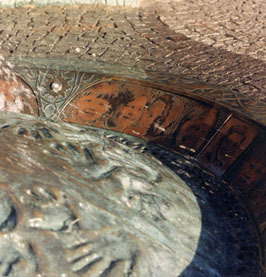 Photographs of children, taken by Guy Woodland, are etched in bronze, forming a circle of companions around the bowl’s interior, among them are bomb victims Jonathan Ball and Tim Parry. 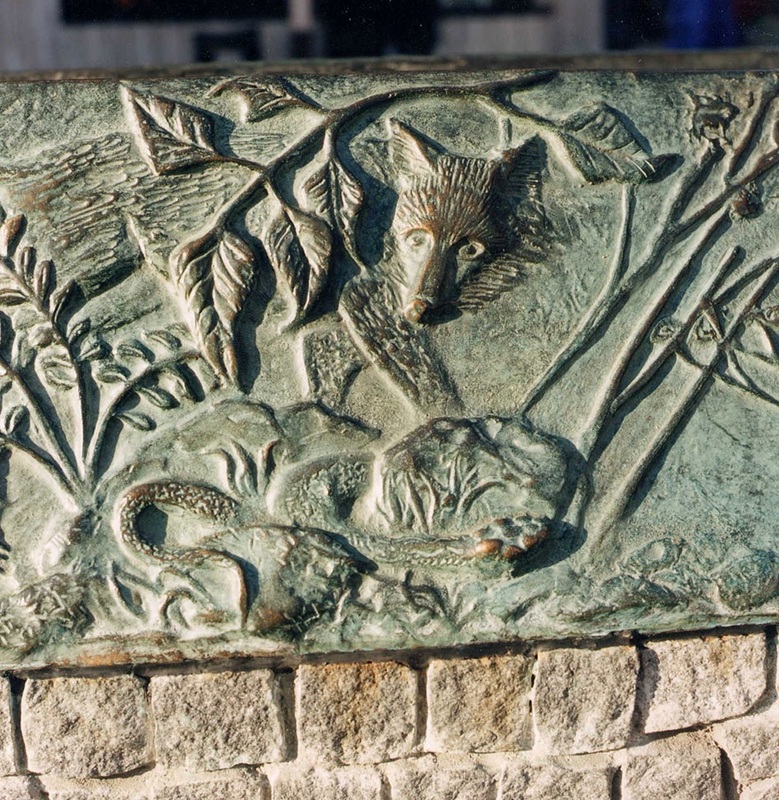 The decorative bronze work that flows along the edge of the feature reveals a creation story based on flora and fauna of the River Mersey. The fountain was very kindly funded by the Duke of Westminster. 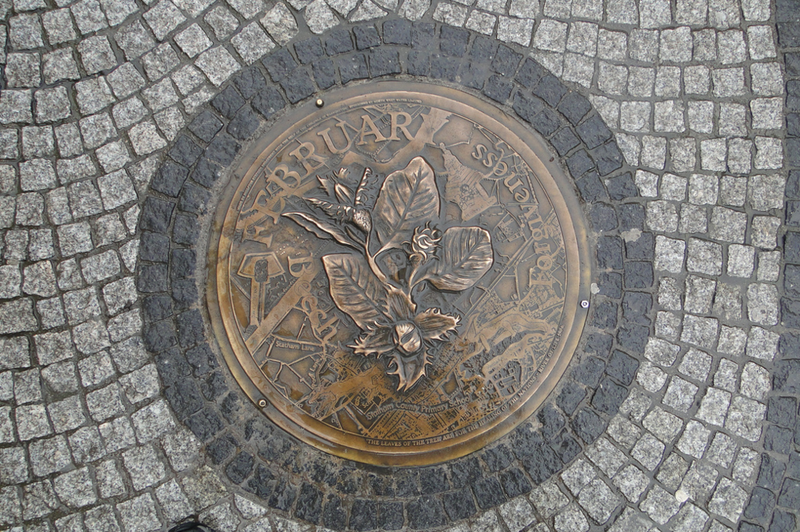 Twelve bronze discs are set at intervals along the length of the ‘river’ were prepared by pupils of 12 local schools, The background of each disc is a section of an ordnance survey map depicting the immediate area around the school overlaid with a variety of symbols and designs developed over three different days working in each school. The first day we chose a particular tree and learned all about it with the help of a park ranger, it’s leaf shape and fruit was studied and drawn by the pupils. The second day each school discussed the ‘fruit of the spirit’ and chose on the ‘fruits’ for their own bronze disc along with the month of the year and their school badge. The third day we were joined by a local historian who shared stories of the past linked to the locality of the school such as the oldest horse that has ever lived, or the cast iron ship that sank on its maiden voyage. These stories were illustrated by the pupils and incorporated into the bronze discs. 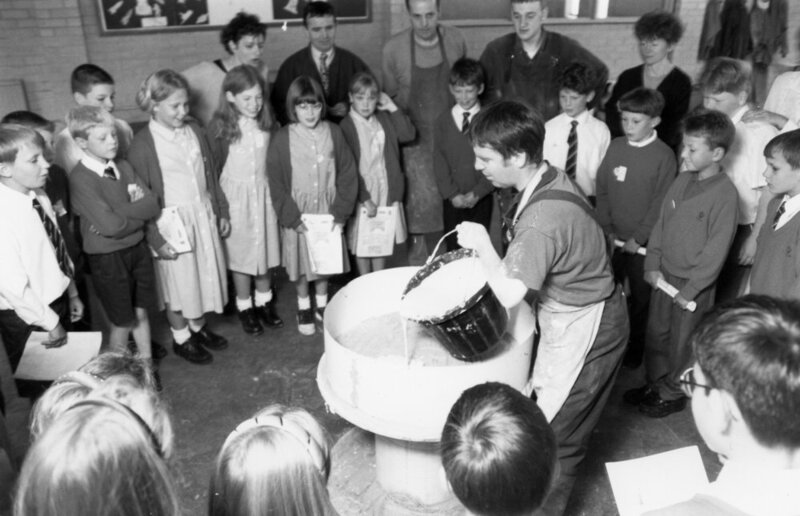 Each school also visited our studio to witness the casting of their design in plaster, prior to casting in bronze, and received a full size copy of their own floor disc. 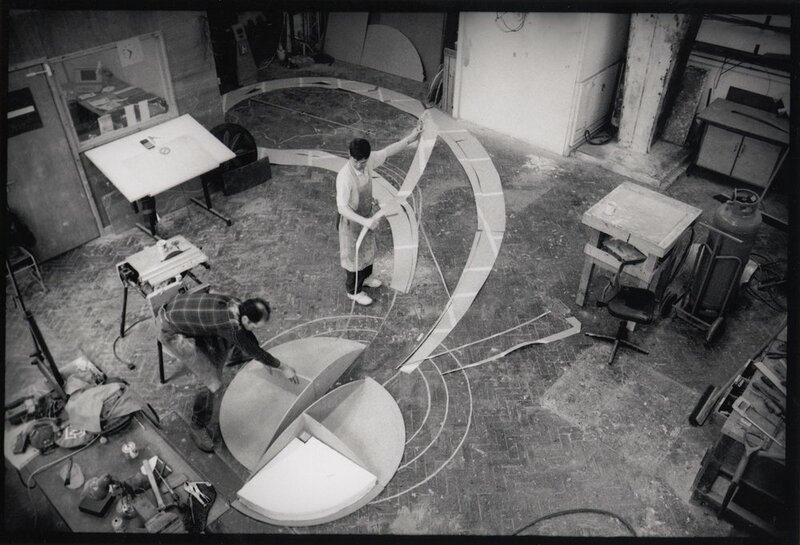 The River life design was a turning point for our studio as we had clearly demonstrated how an artist can effect every element of the streetscape and not just a sculpture plonked into a space. 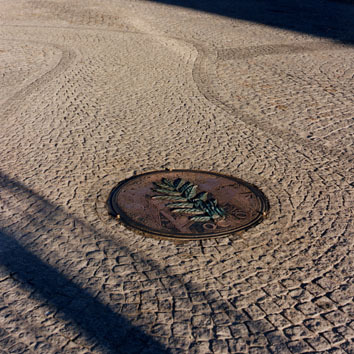 We championed a truly integrated scheme that included paving design, seating, tree grilles, lighting columns and even decorative drainage channels. Considerable risk and massive effort was needed from ourselves to make something happen like this, there were very real hurdles to overcome but for all involved there was a great sense of achievement. For me the proof of it’s success was that for ten years after the terrible events, the twelve participating schools returned to participate in a memorial day, including church and civic leaders, who walked the river stopping at each disc where the schoolchildren prayed or sang. This was not about an artwork created by an artist and his team, but a space that helped serve a liturgical process of healing and reconciliation. On the 20th anniversary the streetscape still looked great and played a central part in a special memorial service where hundreds of people gathered to stand shoulder to shoulder, in silence, paying their respects. Balloons and white doves were released into the Warrington skies – a simple gesture which acknowledged the grief of victims’ families and the grief the town of Warrington felt and still feels today.